This no bake fruit tart is filled with creamy banana filling with a secret ingredient: cauliflower! Don’t worry- you don’t taste it, it just tastes like fruity goodness, but it’s secretly good for you! Paleo, dairy free, and made in five minutes! In a food processor pulse together ingredients for curst until the mixture sticks together in your fingers when you pinch it. Then press into the bottom of a 8" or 10" tart pan (I line the bottom of my pan with parchment paper for easy removal). If you have time, pop it in the freezer for as long as possible. In a high speed blender puree ingredients for filling until smooth then scoop over crust. 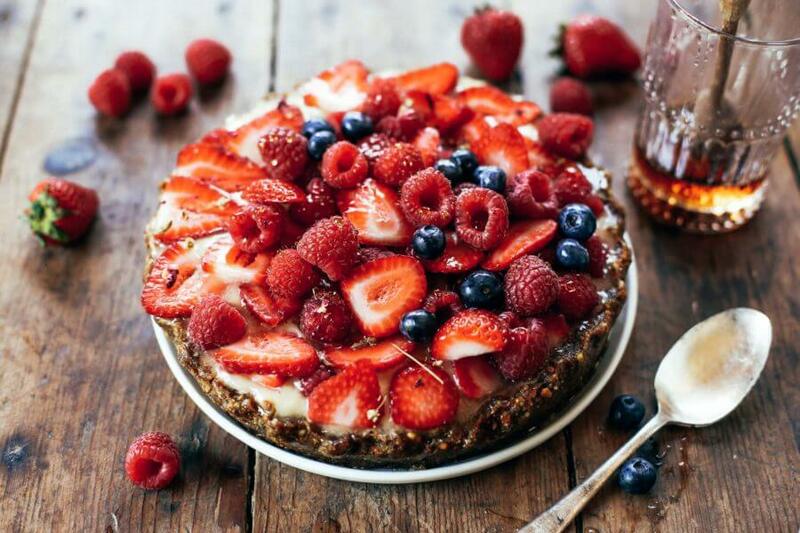 Top with berries, a drizzle of coconut milk and honey. Note: if the filling starts to get runny, just pop it in the freezer for a few minutes! Nutrition Facts 5 Minute Fruit Tart With Creamy Banana Filling Amount Per Serving Calories 491 Calories from Fat 279 % Daily Value* Total Fat 31g 48% Saturated Fat 3g 15% Polyunsaturated Fat 22g Monounsaturated Fat 4g Sodium 12mg 1% Potassium 640mg 18% Total Carbohydrates 51g 17% Dietary Fiber 7g 28% Sugars 32g Protein 9g 18% Vitamin A 1% Vitamin C 54% Calcium 6% Iron 10% * Percent Daily Values are based on a 2000 calorie diet.